This is a guest post by the Rev’d Dr Gavin Ashenden. But how does Mr Burnham know that? It appeared that it simply was not true. Salman Abedi’s friends, who obviously knew him well, say that the truth was different. They describe him as a devout Muslim who had even memorised the Koran. Dr Hall never put the record straight. The Prime Minister Theresa May spoke outside No.10 the day following the slaughter of bystanders on London Bridge on 4th June. She talked about the single evil ideology of Islamist extremism “that preaches hatred, sows division and promotes sectarianism”. What is Mrs May’s authority for making this far-reaching theological statement? “And kill them wherever you come upon them, and expel them from where they expelled you; persecution is worse than slaughter. But fight them not by the Holy Mosque until they should fight you there; then, if they fight you, kill them — such is the recompense of unbelievers, but if they give over, surely Allah is All-forgiving, All-compassionate. Fight them, till there is no persecution and the religion is Allah’s; then if they give over, there shall be no enmity save for evildoers” (2:191-193). “Islam makes it incumbent on all adult males, provided they are not disabled or incapacitated, to prepare themselves for the conquest of (other) countries so that the writ of Islam is obeyed in every country in the world… But those who study Islamic Holy War will understand why Islam wants to conquer the whole world. “..Those who know nothing of Islam pretend that Islam counsels against war. Those (who say this) are witless. Islam says: Kill all the unbelievers just as they would kill you all! Does this mean that Muslims should sit back until they are devoured by (the unbelievers)? Islam says: Kill them (the non-Muslims), put them to the sword and scatter (their armies). “Does this mean sitting back until (non-Muslims) overcome us? Islam says: Kill in the service of Allah those who may want to kill you! Does this mean that we should surrender (to the enemy)? Islam says: Whatever good there is exists thanks to the sword and in the shadow of the sword! People cannot be made obedient except with the sword! “The sword is the key to Paradise, which can be opened only for the Holy Warriors! There are hundreds of other (Qur’anic) psalms and Hadiths (sayings of the Prophet) urging Muslims to value war and to fight. Does all this mean that Islam is a religion that prevents men from waging war? How is it possible that we can continue to keep up this pretence of patronising, intolerant duplicity where we pretend we know Islam better than those who live and practise it? Why won’t Andy Burnham, the Dean of Westminster and the Prime Minster tell us the truth? The answer is probably that if they did, they would be required to face a problem to which there is either no solution, or one that tests what is politically possible to the utmost limits. The question they should really ask is the more interesting one which relates to those Muslims in Western society who have not turned to violence. Why have so many Muslims who live amongst us not turned to violent Jihad? The answer may be that they simply don’t want to, or are not very observant Muslims, or at least not as observant and pious as those who do turn to violence. Or it may be that they are kind and generous people who see much good in the first half of the Koran where Mohammed says generous things about Jews, Muslims and Christians being cousinly ‘People of the Book’. Perhaps they prefer to commit a lesser sin against the principle of abrogation, which requires them to preference the violent and inhospitable passages mainly near the end of the Koran over the benign ones near the front. “I will cast terror into the hearts of those who disbelieve. Therefore strike off their heads and strike off every fingertip of them” (8:12). If our politicians and religious leaders were to find the courage and integrity to do their primary duty by us and tell the truth about Islam, Islamists, Muslims, Jihad and accommodation, what would follow? That is the very debate we have to have now in public. It might involve a variety of draconian measures, proportionate to the public slaughtering of citizens that Islam has perpetrated across Europe. The political authoritarians might incline toward internment, expulsion, the public monitoring or closing down of mosques, the abolition of Islamic faith schools and other measures the outcome of which would be the restoration of the rule of law and the control of our public spaces. The drastic measures might be considered proportionate to the civil disaster Islam is wreaking upon us. The pragmatic measures will be for experienced politicians to wrestle with. But before the pragmatism comes the demands of theory and the integrity of ideas. First of all, we have to be able to tell the truth in public. The new Government must abolish the notorious and noxious crime of ‘hate speech’. It must break any link between the sane and sensible reaction of Islamophobia and the criminal law. Islamophobia is a sane and justified fear of those people and ideas that threaten murderous violence on our citizens. We must be free to tell and test the truth by speaking it in the public space, and our politicians must commit themselves to becoming theologically and philosophically literate so they can tell the truth in public. What might the Church contribute to this sudden need for theological literacy and courage? It might find the intellectual muscle and integrity wholly to repudiate the heresy of relativism, and help the faithful and atheist public learn to make comparisons between the good, the anodyne and the evil. Without imposing absolutes upon people reluctant to adopt them, it might nonetheless, within the broader context of universally-recognised absolute categories of good and evil, make comparisons. 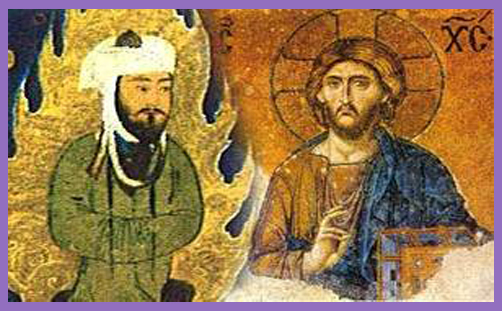 Let there be comparisons be between Jesus and Mohammed rather than between Christianity and Islam. Let the facts and values that separate these two representatives of worldviews, whose legacies and followers define the struggle for sanity and sanctity in society, be compared contrasted and chosen between. We might begin with Mohammed’s doctrine of Taqiyya, (un)holy deception. The Qur’an in a variety of verses (eg 2:225, 3:28, 3:54, 9:3, 16:106, 40:28, 66:2) establishes the religious legitimacy of breaking oaths, lying, unilaterally violating treaties, and generally scheming against non-Muslims. Set this against Jesus claiming that he was the Truth, and the Truth will set us free (Jn 8.32). It might begin there, but it can’t end there. Only misery, murder and mayhem will wake us out of our numb and illusory escapism. How much more of this escapism are we going to hide in? How many more lives are we going to sacrifice to our sedated, over-comfortable secularism, before we decide we can and we must start dignifying our democracy with telling the truth? And after we have re-learnt to tell the truth, we must face the challenging consequences which the truth confronts us with, and upon which both our integrity and, for some of us, our lives depend.